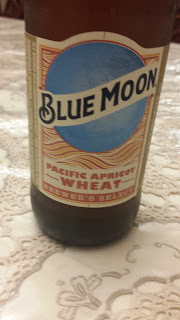 This week's Sunday Night Suds looks at Blue Moon's Pacific Apricot Wheat Ale. I found this beer in the little Target in Elmont, NY, although I had not yet seen it at any local beer store. As I had never seen any kosher certified apricot beer, I knew that I had to buy some so I picked up a six pack. (Since the beer was for sale in six packs, I would assume that it is also available in twelve packs, although I did not see any on the shelf). They say that good things come to those who wait, but my life long wait for kosher apricot beer was not worthwhile (although Mrs KB did give the beer a thumbs up). The carbonation is strong, perhaps a little bit too strong. The beer poured a cloudy light orange and had a scent of kids lip gloss (yes, I have three daughters). The first sip was heavy with artificial faux fruit flavor and although I tried this beer both ice cold and closer to room temperature (and even after being left out to let the carbonation die down) the artificial sweetness overwhelmed the beer and was just not enjoyable for me.